For people in North East Pastoral and parts of North West Pastoral districts. Issued at 6:23 pm Tuesday, 6 November 2018. Strong thunderstorms affecting parts of northern SA. 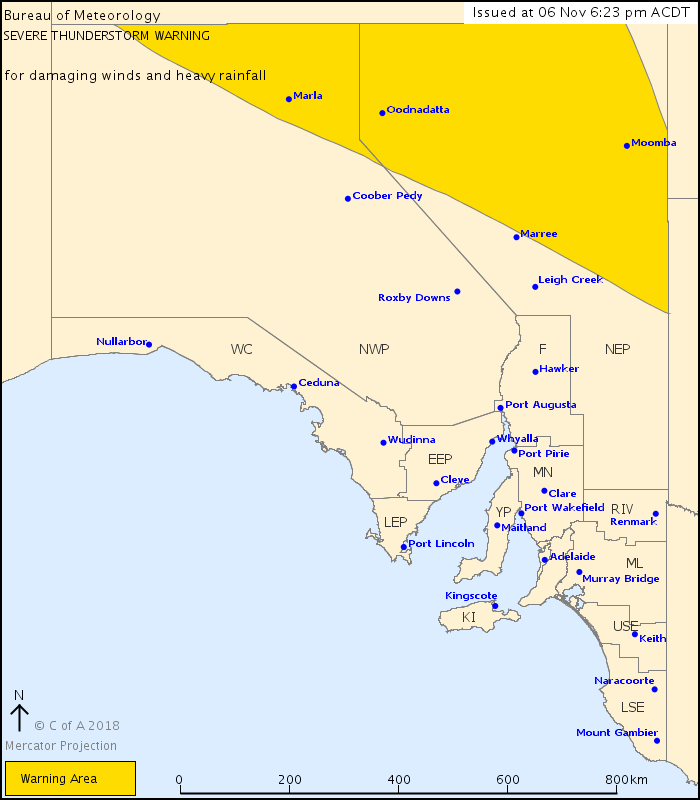 Severe thunderstorms are likely to produce damaging wind gusts in excess of 90 km/h and heavy rainfall that may lead to flash flooding in the warning area over the next several hours.There is also a risk of some hail with storms in the APY Lands. Locations which may be affected include Ernabella, Oodnadatta, Dalhousie Springs and Moomba. * Secure or put away loose items around your property. * Move cars under cover or away from trees. * Keep clear of fallen power lines. * Stay indoors, away from windows, while storms are nearby.